This crescent was found in May of 2002 during an archaeological survey on the US Army Dugway Proving Ground in Tooele County, Utah. The project was called the Lake Oferneet Survey. It was found within a geological formation known as The Old River Bed which is an abandoned river delta that flowed onto the floor of the Great Salt Lake Desert and, for some time, into ancient Lake Bonneville. Based on its context, this Crescent may date sometime prior to about 12,000 calibrated years before present. This type or style of Crescent is sometimes referred to as a butterfly Crescent because of its angular edges at both ends. They have the appearance of being resharpened from Crescents that once had uniformly curved edges. Crescent is the term that is most often used to describe these uniquely shaped early tool forms. But in fact, they were actually described and named Great Basin Transverse points by C.W. Clewlow Jr. in 1968. Most crescents are curved with a concave edge on one side and a convex edge on the other so the descriptive word "crescent" is most often used. 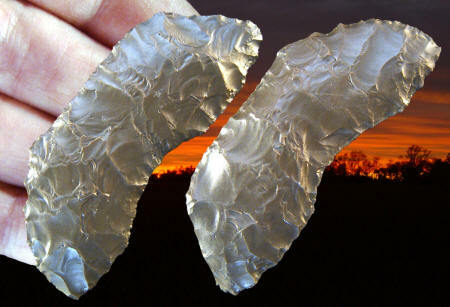 Some archaeologists believe the Great Basin Stemmed Point Tradition is directly connected to Crescents. This crescent measures 2 1/2 inches (6.3 cm) long.